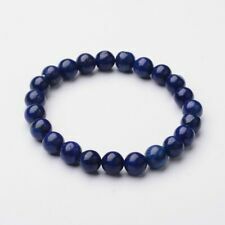 Natural gemstone bracelet, the love magnet, rose quartz and lapis lazuli 7"
It stimulates the desire for knowledge, truth and understanding, and aids the process of learning. A stone of truth, Lapis encourages honesty of the spirit, and in the spoken and written word. Wear it for all forms of deep communication.